On Scene: Buy any 2 Boston Leather Products, get 10% off! Buy any 2 Boston Leather Products, get 10% off! Boston Leather is a company that makes amazing, high quality fine leather accessories since 1938 and TheFireStore has them all for your convenience! Right now, if you buy any two Boston Leather accessories, you'll automatically get 10% off. What a deal! We've got universal cases that fit most---along with the famous Boston Leather Radio Strap, anti-sway strap, cell phone case , combo packs, belts, flashlight holders and more! 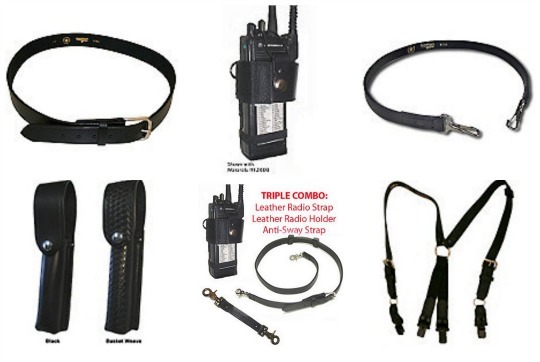 The Boston Leather Triple Combo (shown above) is a great product that comes with a Leather Radio Strap, a case for your radio, and an anti-sway strap to make sure your strap stays in place without flopping to the front. So, shop around all Boston Leather---you won't be sorry! Remember, any two products, once added to your cart, will automatically deduct 10%. Nice collection of leather products.